75% of Americans over 40 are behind on their retirement savings, according to the GoBankingRates survey conducted in 2016. It’s only natural for people to focus on the present – such as today’s bills and needs - and assume they’ll have time to save later. 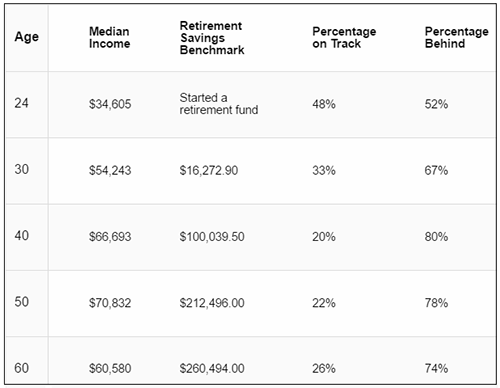 As you can see in the chart below, saving for retirement later in life has a strong adverse effect on how much you will have saved by the time you reach retirement age. In today’s precarious economy, however, it’s becoming more vital to not only save for your retirement, but to diversify your assets outside of stocks and bonds. You can do so with a self-directed, precious metal IRA, that adds a layer of protection to your savings. In addition, U.S. investors are seeking to move their retirement savings outside of U.S. borders due to the economic and political uncertainty. Traditionally, they would seek offshore storage across the world in Singapore, Hong Kong or Zurich. But today, investors can store their metals offshore much closer to home with one of the world’s lowest storage rates. One of our clients’ top choices for this offshore solution is found in the Cayman Islands at Strategic Wealth Preservation (SWP). Along with the tax-advantages of a precious metal IRA, you can also receive tax-advantages by storing in the Cayman Islands. There is no direct taxation of any kind, nor has there ever been, in Cayman’s history. No income tax, no sales tax, no capital gains and no inheritance tax have ever been implemented. Precious metals are not subject to tariffs upon entry into or exit from the country, nor is the purchase or storage of precious metals in the Cayman Islands subject to value added tax (VAT). When you store your precious metals with SWP, you can do so with complete peace of mind. Your investment is always 100% insured. All of your holdings are also fully allocated and segregated in an offshore, investor-friendly jurisdiction. 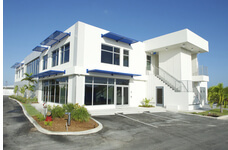 Your precious metals would also be housed within one of the largest and most respected security companies in the Caribbean, at the impressive complex of Cayman Technology Centre (CTC). Unlike many traditional offshore venues that are actually banks, SWP is a private storage institution that is not subject to reporting to the Cayman Island Monetary Authority. SWP does not have any wealth-reporting requirements. The Cayman Islands is the fifth largest financial center in the world. The financial industry is Cayman’s lifeblood and, as such, economic freedom is understood both by its government and its people to be essential for mutual prosperity. In addition, SWP is one of the closest offshore storage options available to North American investors seeking to internationalize their hard assets. Their facility is located less than one mile from the major airport. What furthers SWP’s uniqueness is their concierge storage. They cater to your investment requirements to create a seamless experience with acquisitions, logistics and storage needs. You are welcome to visit your holdings at SWP to judge the reliability and security of their services for yourself. Along with these benefits, SWP offers one of the world’s lowest storage rates with no minimum purchase required. Their storage rates for IRA metals are also competitive with U.S. domestic rates. Consider diversifying your IRA-approved precious metals offshore in the Cayman Islands to achieve peace of mind for your future. This is one of the safest offshore jurisdictions in the Western Hemisphere to store your retirement nest egg. Keep What’s Yours… on Grand Cayman. Call us at 800-831-0007, or send us an email to get started with storing your IRA-approved precious metals in the Cayman Islands.